If ever you've fantasized about being a fashion statement-maker, you might consider the art of learning how to wear purple shoes. We don't mean simply slipping them on, of course. When it comes to this regal hue, a certain finesse is required in order to really pull it off. It's actually not as difficult as one might think to pull off a pair of purple shoes. Sure, it requires a bit more thought than, say, pulling on a pair of black boots, but purple doesn't have to be a scary, shunned shoe shade. In fact, infusing a little purple into your wardrobe is a quick way to turn a dull ensemble around. Having a pair of versatile purple heels on hand can instantly make a drab outfit just dandy, and you can count on a pair of purple flats to come in handy with certain dresses or skirts throughout summer. Meanwhile, purple boots are an edgy choice that almost anyone can appreciate when worn with the right attire. Obviously, what matters most is what you wear with those purple shoes. Purple isn't necessarily the very definition of versatile - it's certainly no black or brown - but its beauty rests in the fact that there are so many variations of the shade itself. Think about it: Lavender and eggplant are two completely different shades of purple. One is light and summer-friendly, while the other is rich and fall-appropriate. There are so many ways to wear this universal color that it seems almost a shame not to own at least one pair of gorgeous purple shoes! Blend colors. 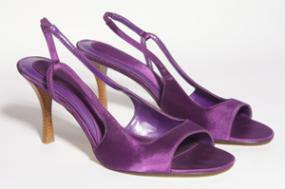 If you aren't comfortable wearing something completely purple, opt for a pair of neutral sandals with a purple accent. A pair of gold or silver metallic sandals with sinewy purple straps is a great example; they make a sophisticated style statement, but don't scream for attention with every step. Keep it low-key. Again, if vibrant purple isn't your choice, consider a lavender loafer by a high-end label like Kate Spade or Tod's. Accented with diminutive tassels, these types of shoes are less bright and more appropriate to wear on a regular basis. Try them with everything from jeans during the spring to shorts in the summer. If you prefer a truly regal shade of purple, don't shy away from going all out. A pair of velvet flats is an ideal choice that works well throughout fall and winter. Worn with tights and a flared dress, bright purple flats look simply adorable. They also add a bright touch to a somber winter palette. ...or step into classy heels. If you're itching to add a little flair to your otherwise very simple, almost clinical workout ensembles (we're looking at you, white T-shirts and bland running shorts), consider a pair of chic sneakers with purple accents. Colorful running shoes have become as popular as ever, so it's easy to find shoes that are either entirely purple or just touched by a hint of it. Either way, it's a fun way to incorporate the color into your wardrobe. Embrace sophistication. Purple doesn't have to mean garish or outlandish. Try a pair of classy, open-toe or pointy-toe heels in a rich eggplant shade for an extra elegant result. Or go the opposite route and kick things up a few notches. The truth is that you'll find more vibrant purples than low-key ones, so you're bound to find something that really grabs your attention. From shocking purple suede lace-up stilettos to purple patent leather platform heels, the options are endless. Your best bet is to shop by color on Web sites like Bluefly or Nordstrom. For truly vibrant shoes, check out Chinese Laundry and Steve Madden.